There is need to realise the importance of sports in children’s lives instead of just remaining occupied by the idea of ensuring one’s wards emerging as the topper in every school examination they undertake, writes Sandeep Datta of Elets News Network (ENN). It’s not whether you get knocked down; it’s whether you get up,” Vince Lombardi, one of the greatest American football coaches of all times once said underlining what games teach us all in life. Away from rubbishing games as a wasteful activity or something limited to winning medals, there is need to explore the signifi cance of our children playing games or showing interest in various sports. Parental worldview about games that their children like or dislike needs transformation. Sports are about such incredible moments where sheer human will and a strong desire overcomes the odds. This is the spirit that sports evolve in students when they are exposed to various games. These are the moments that make some moments memorable. There is growing requirement to realise the importance of sports and games in school encompasses more than just the benefi t of physical activity. Increase in selfesteem and mental alertness make school sports and games necessary for every school age child. In many foreign countries, students’ education is no longer limited to just lecture- theatres. The monotony of lectures has been very much minimised by outdoor work and participation in games and sports and various athletic feats. These develop healthy competitive spirit and interest in students’ life. We all know children should be active for optimal health. But it’s not very uncommon to find many of them leading sedentary lifestyles due to smart phones, computers, video games, television and lack of physical education in many schools. According to The American Heart Association, one can swap one’s child’s TV time for a fun 60 minutes of physical activity every day and help to protect them from childhood obesity, high-blood pressure, type 2 diabetes and high cholesterol. 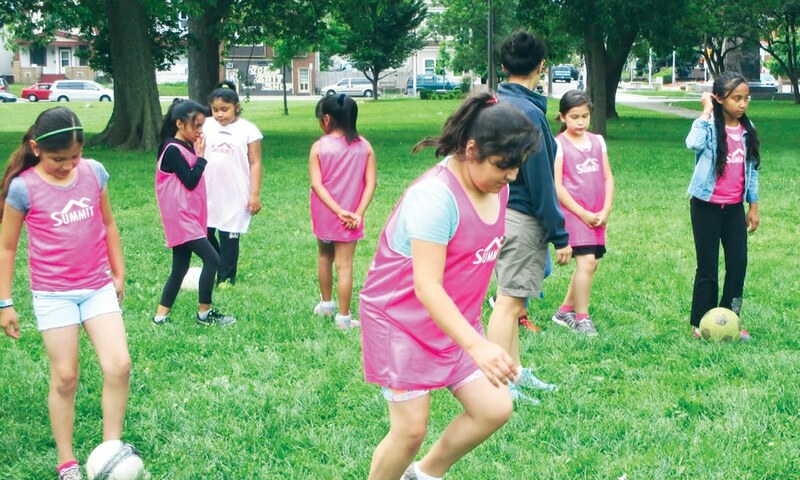 Significance of Games in Education There are many benefi ts of games and sports in education. Outdoor games such as cricket, football, badminton, tennis, etc. have various benefi ts. Even though they may not result into immediate gain, the participation in any one of them does have its positive impact. They may tell upon the health for the time being and may also affect education temporarily. But the outdoor games gradually build up a healthy body and make the mind energetic. Balloon blitz, an appropriate game for students of all ages in an elementary school, helps to improve coordination of children as well as enforcing the importance of teamwork. This exercise also provides vigorous activity for children. Scooter soccer helps to teach teamwork, coordination as well as following directions. The class should be split into two. Each team will need a goalie. Children will use scooters to maneuver around the gym. Children are only allowed to use their feet to kick the ball around the gym and attempt to score a goal. Spin-and-Run Spin-and-run is a simple race game that provides entertainment and helps to improve coordination in elementary children. Spin students around in circles 10 times. Have them try to run across the gym. Time each student. The student with the quickest time is the winner. As parents, we should think if our kid needs motivation to play? Perhaps, yes.There is need to understand some children do not consider themselves athletic and may prefer not to play organised school sports. They may be cut from the school team for lack of ability. For this group, there are intramural teams, which are sports for those not interested or able to play higher level athletics. In such cases, it is important not to make your child feel guilty of not being a higher level athlete. Rather, such kids should be reminded about more important benefits of playing sports, and encourage them in this endeavour. Kids love fun and obstacle courses are a creative way to get them motivated and moving. Obstacle courses are simple to set up at home, the park, the playground or the beach, and one can use a variety of things as equipment. There are ways to do it. Get creative and use toys in the closet, stuffed animals, soccer balls, footballs, jump ropes, soup cans and old dish rags to set up as the obstacles. Make each obstacle fun and challenging and keep the game going for 15 to 30 minutes. According to the American Council on Exercise, strength training with light weights and body resistance exercise is safe and effective for nearly all healthy children. Strength training promotes healthy bone growth, improves self-confidence and improves muscular fitness and motor fitness performance. It’s fun to involve the family in fitness activities and set a good example. One can attempt this workout anywhere, inside, outside, at home, in a park or at the beach, without requiring any equipment. Begin with slow movement such as marching or walking with silly arms and hands for five to eight minutes. Next, move into the active phase of faster, bigger movement, such as kicks, punches, jumps and sprints for 15 to 30 minutes. Modern-day parents need to understand, it takes years to prepare a star child. They should never forget to pat on the back of children on their every little or big victory. Most importantly, in case, they are not performing well, don’t berate him or her. Just remember. It takes years of practice in the playground and street-matches to grow up as cricketers like Sachin Tendulkar or Virat Kohli.